Exhibition Dates: February 7–25, 2018. 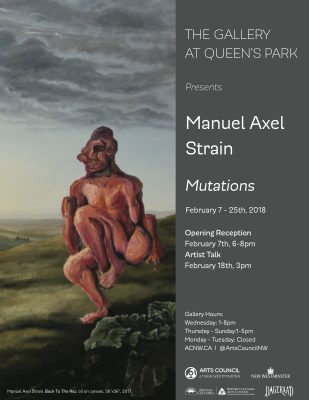 The Gallery at Queen’s Park is pleased to present Manuel Axel Strain’s solo exhibition Mutations. Mutations is an on-going self reflective practise in which artist Manuel Axel Strain attempts to understand the way colonization has led to a contorted sense of identity. Through this investigation of self, Strain hopes to renegotiate the relationship to his First Nations identity. Strain intends to use his lived experience to inspire social and political change in the colonial state of Canada. Manuel Axel Strain is an interdisciplinary artist of Coast Salish, Secwepemc, and Okanagan descent. 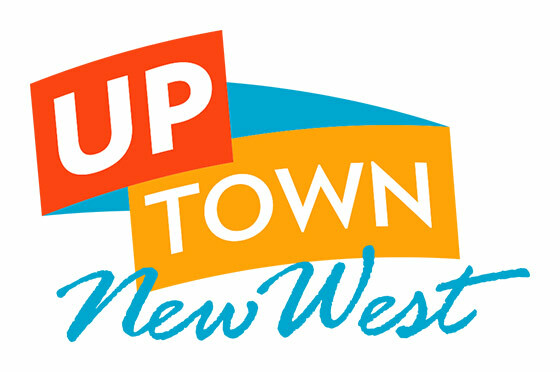 Strain was raised in the suburban neighbourhood of Maple Ridge with little knowledge of what it meant to be a person of First Nations descent. This upbringing lead Strain to examine the construction of First Nations identities – in particular the internal conflicts that arise from imposed identity constructs. He works with painting, drawing, sculpture, photography, and video installations. His practice confronts the legacies of colonization that have been left upon the identities of the First Nations people of Canada. Strain is mainly concerned with post-colonial notions of hybridity, assimilation, cultural appropriation, self determination and resistance. Through the appropriation of euro-centric art he simultaneously accepts these legacies and rejects them while subverting colonial perception of indigenous art. His purpose is to redefine his indigeneity and break the cycle of inaccurate generalizations. His goal is to move beyond the binary opposition of the colonizer and the colonized to establish new ontologies for the First Nations identity.